First Meal: Ever since my dad died in 2017 my mom has no one to serve. I believe we are all here to serve, to be of service in one capacity or another. For mom, she literally is here to serve; to serve food. She has mild dementia now and has little to motivate her each day. I stayed over last night and in the morning I called her from the guest room to remind her I was in the house, so she wouldn’t be frightened hearing someone (me) moving around. She got up and did what she knows how to do best, serve. She made a table spread as lovely and abundant as she could. She carefully cut and sliced a fresh Pineapple and organic Oranges and arranged them with organic Bananas. She presented a plate of vegan Chao slices I buy for her now instead of high cholesterol Muenster cheese. 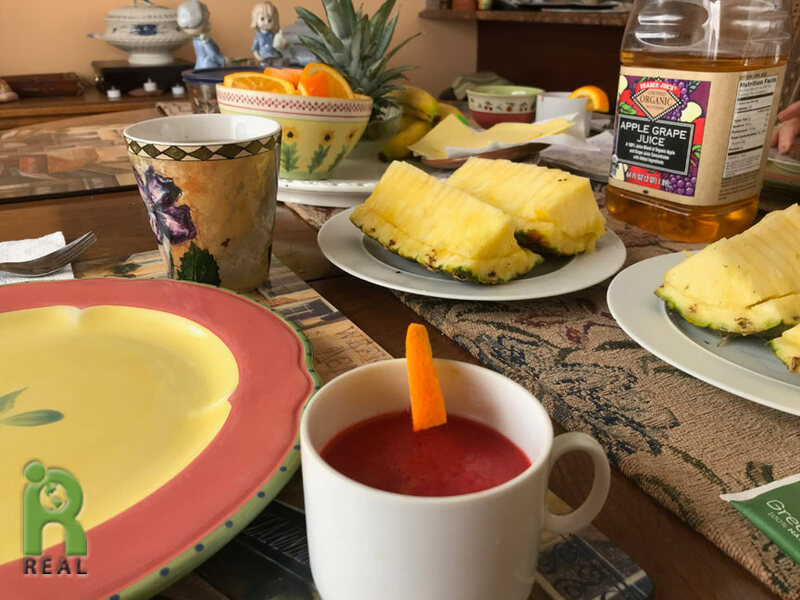 She had some leftover blended organic frozen Strawberries that she served anew with a fresh slice of orange. And she toasted some organic Ezekiel Cinnamon Bread and set out the organic Earth Balance buttery spread. There was organic Apple Juice and Green Tea. I was happy to celebrate the morning feast she had prepared. I was set on having Steel Cut Oats. Mom doesn’t like oatmeal, although she has loved it when I’ve made it for her. 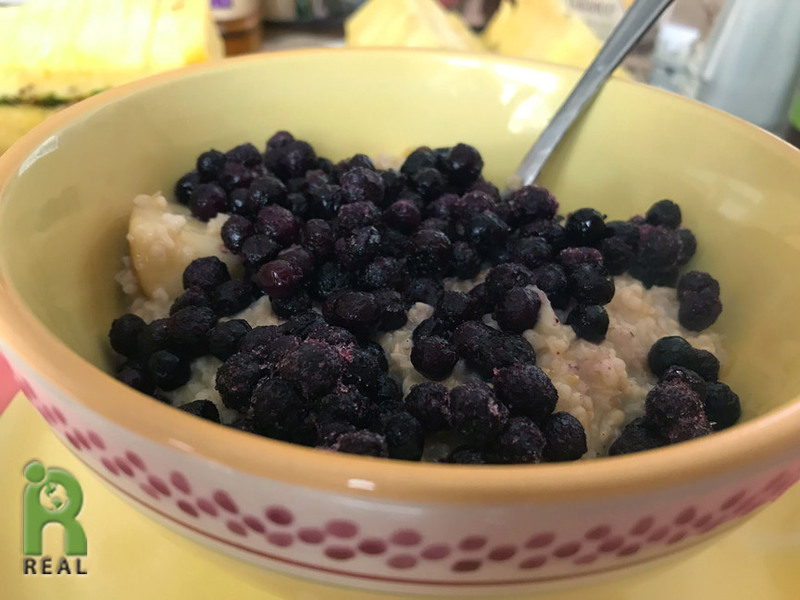 I made some organic Steel Cut Oats for me, with an organic Apple and organic frozen Blueberries. Second Meal: I had my list of things to do for mom before I could go home and attend to my own list of tasks. I made her Vegetable Soup, Brown Rice, and Yellow Potatoe, foods she can easily reheat whenever she wants. I took a couple of boxes of my dad’s files to take home, review and shred. Mom kept asking me if I was hungry! When I was done with my tasks we sat at the dining room table for lunch. I invited mom’s neighbor Laurie (an angel) over to chat. I had some of the soup I just made. 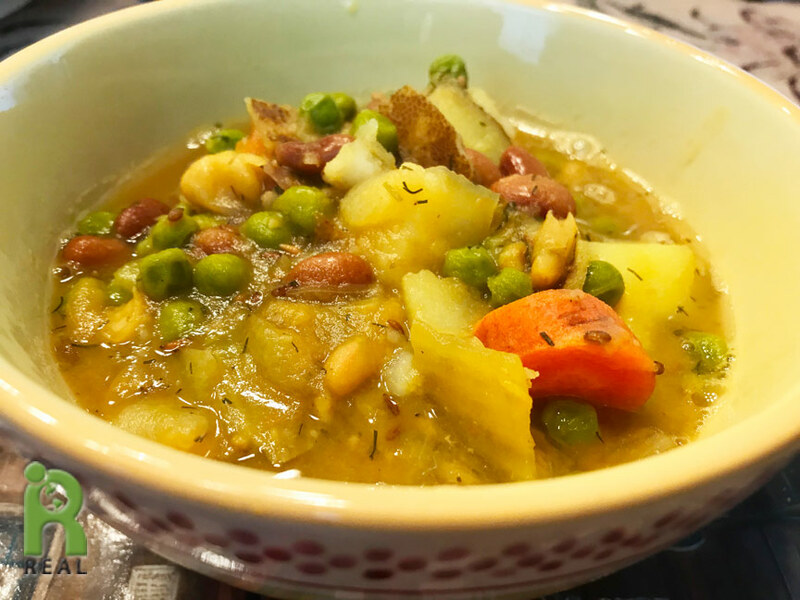 I sautéed organic Yellow Onions, organic Carrots in beer and added in organic Russet Potatoes, organic Peas, organic Cannellini Beans, organic Pinto Beans, Caraway Seeds, Dill, Rosemary, Turmeric and Black Pepper. I also finished up the remainder of the salad I had brought from home, the organic Kale/Red Cabbage/Red Onion/Coconut/Apple/Raisin slaw. Mom ate too and she set out the sliced Pineapple and Oranges again for our guest. 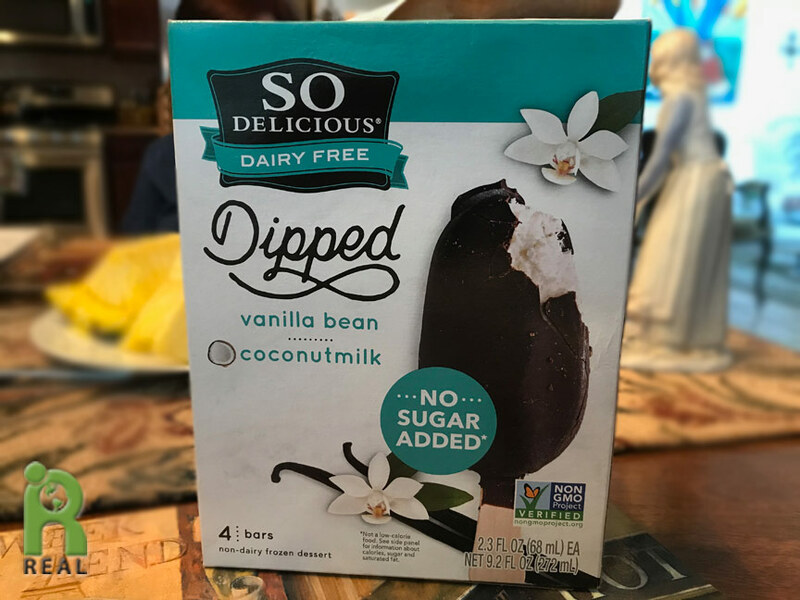 Then she offered “Ice Cream” pops: So Delicious Coconut Ice Cream Vanilla Dipped bars, sweetened with Erythritol. Laurie and I were not hungry but we didn’t want to spoil mom’s party so we shared one. Third Meal: Now at home in the apartment I face a long “to-do” list of my own. Gary comes home Monday morning and I want everything to be as nice as it can be and I don’t want to be buried with deadlines. 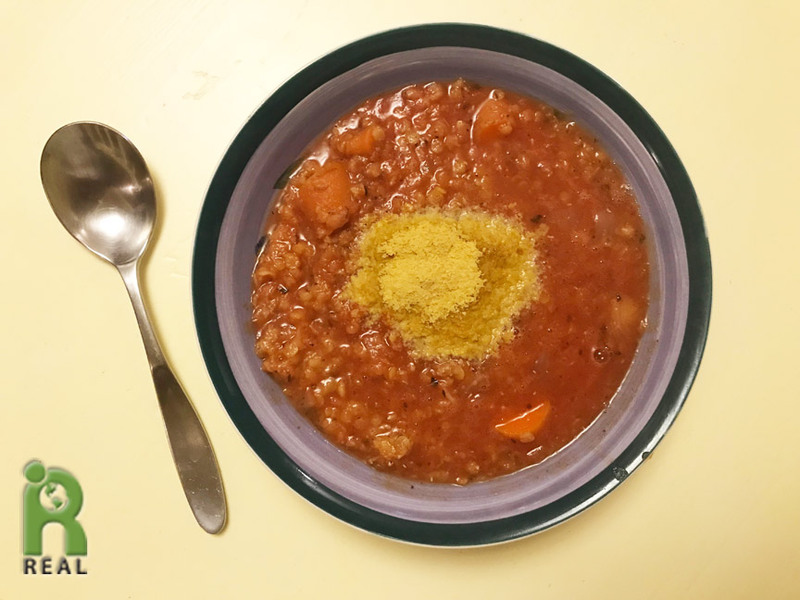 I reheated the organic Red Lentil stew I made a few days back, adding in organic strained Tomatoes from Bionaturae and water, making a new soup, topping it with Nutritional Yeast. Next, I toasted a thick slice of the bread I made and froze recently. 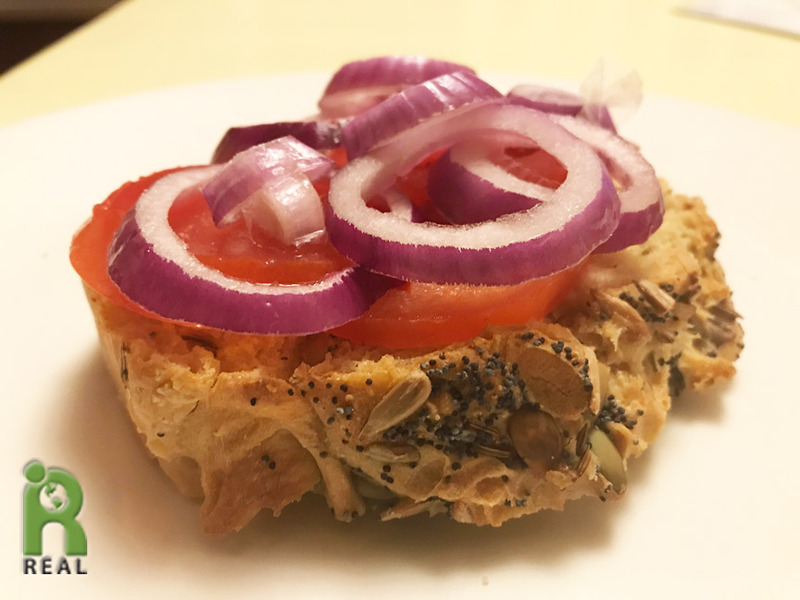 I topped it with organic Tomatoes and organic Red Onions. 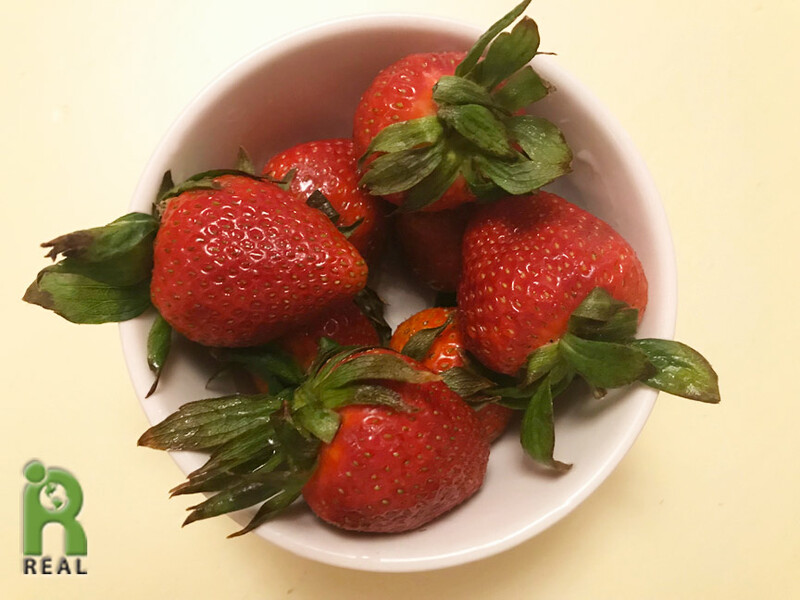 Snack: Later in the evening, realizing once again, that I could not do it all, I took a break and had organic Strawberries.